Whereas the overwhelming majority of brain tumors in adults are supratentorial, infratentorial tumors are common in children. The great majority of infratentorial tumors in children are medulloblastomas, cerebellar astrocytomas, or ependymomas. Most children with infratentorial tumors present with symptomatic hydrocephalus requiring immediate evaluation and management. Operations for infratentorial tumors can be demanding, and surgery in young children and infants in the posterior fossa is associated with additional challenges and hazards. Incidence: Approximately 50% of brain tumors in children older than 1 year of age are infratentorial (1,2). Types: Approximately 30 – 55% of infratentorial tumors in children are medulloblastomas, 25% are cerebellar astrocytomas, and 20% are ependymomas. 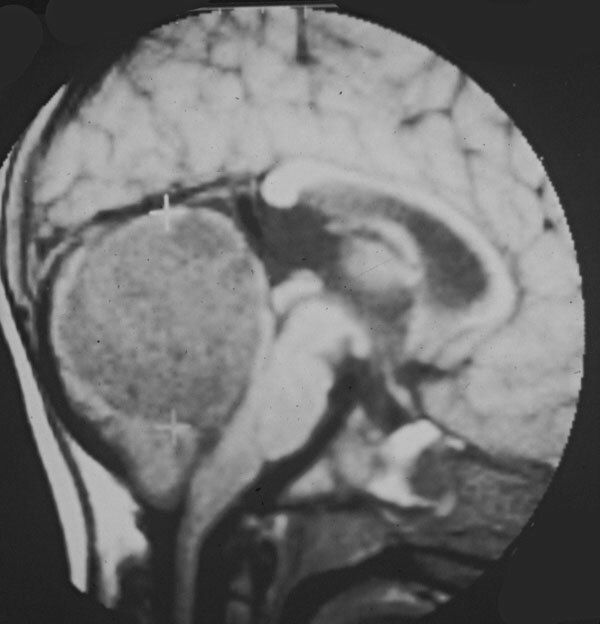 Presentation: The most common presentation of posterior fossa tumors in children is symptomatic elevated ICP secondary to obstructive hydrocephalus. Focal signs are less common.